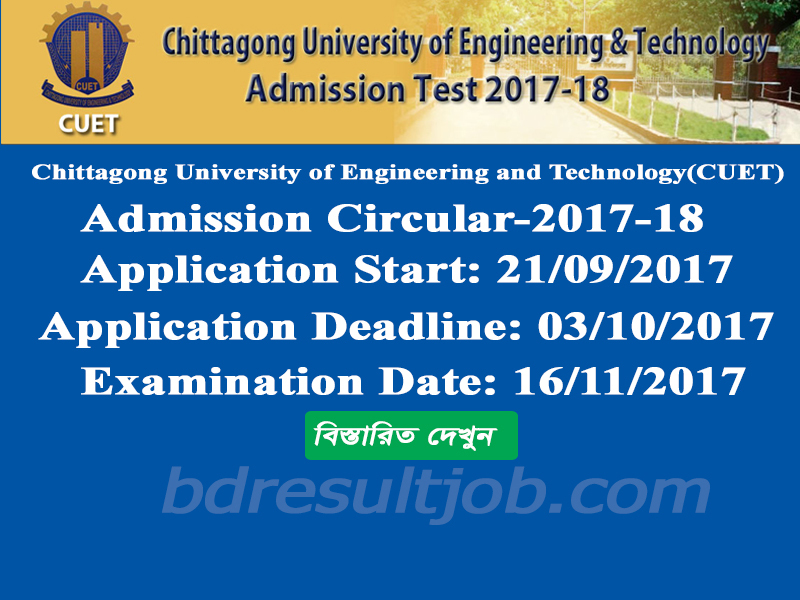 Chittagong University of Engineering and Technology (CUET) Admission Test Circular 2017-2018 has been published. Chittagong University of Engineering and Technology (CUET) Admission Test Circular, Admit Card, Seat Plan, Marks distribution 2017-2018 has been published. b. SSC/Equivalent passing year 2014 or 2015.
c. HSC passing year 2017.
b. GCE A-Level examination Mathematics, Physics, Chemistry and English Minimum B Grade (all subject must separately pass B Grade). 1. Visit http://www.cuet.ac.bd/admission/ or http://web.cuet.ac.bd/admission2017/. 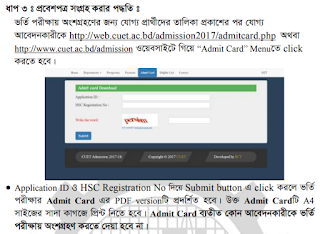 After complete the payment successfully reserved the transaction ID and visit http://www.cuet.ac.bd/admission/ or http://web.cuet.ac.bd/admission2017/. put your application ID and Transaction ID and submit. CUET authority will published 10,000 Candidate Eligible list for Admission Test on 19 October 2017. Download Eligible list here http://www.cuet.ac.bd/admission/. Chittagong University of Engineering and Technology (CUET) 15 October to 01 November 2017 can Download Admit Card. You are 10,000 listed candidate you can download http://www.cuet.ac.bd/admission/ or http://web.cuet.ac.bd/admission2017/admitcard.php. After download Admit card you must candidate sign in the spot. Chittagong University of Engineering and Technology (CUET) Test admission authority will published http://www.cuet.ac.bd/admission/. 16 November, 2017 will published Admission Test Result. 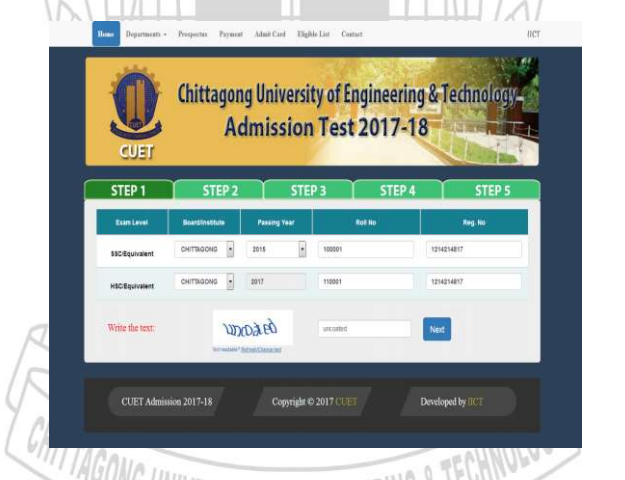 Any applicant can download and view from Chittagong University of Engineering and Technology (CUET) official website http://www.cuet.ac.bd/admission/ search their Admission Test Roll Number. Tags: www cuet ac bd admission, Chittagong University of Engineering and Technology (CUET), Chittagong University of Engineering and Technology (CUET) Admission Circular, Chittagong University of Engineering and Technology (CUET) Admission Test Result 2017-18, Chittagong University of Engineering and Technology (CUET) Admission waiting list Test Result 2017, cuet Admission Circular, cuet Admission Notice 2017, cuet Admit Card Download, cuet Seat Plan, cuet Admission Mark Distribution, Chittagong University of Engineering and Technology (CUET) Mark Distribution 2017, CUET Admission Test Result 2017, CUET Undergraduate Online Application 2017, CUET Undergraduate O Level Application form 2017. Bangladesh Education and Job Portal: Chittagong University of Engineering and Technology (CUET) Admission Test Circular 2017-2018 has been published. 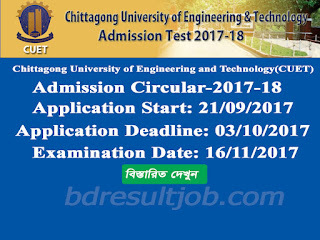 Chittagong University of Engineering and Technology (CUET) Admission Test Circular 2017-2018, Chittagong University of Engineering and Technology (CUET) Admission waiting list Test Result 2017, Chittagong University of Engineering and Technology (CUET) Mark Distribution 2017, CUET Admit Card Download.